NEW YORK (CNNMoney) - The unemployment rate tumbled in September as more people returned to the labor force and steady hiring continued. Employers added 114,000 jobs during the month, down from a revised 142,000 jobs in August, the Labor Department said Friday. 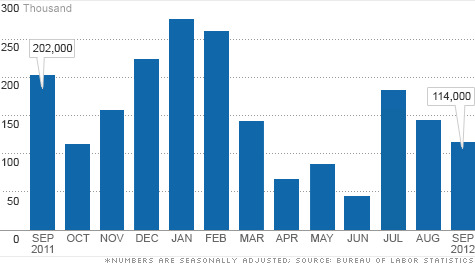 But revisions to July and August mean the economy added 86,000 more jobs than originally reported in those months. Meanwhile, the unemployment rate unexpectedly fell to 7.8% in September, from 8.1% the prior month. It always comes out first friday of the month. Just like the next will be out November 2nd. Just TWO WEEKS AGO, the Chairman of the FED, said that we have to print, and add 40 Billion dollars a month to the economy, due to the 'GRAVE' jobs numbers ... and, now 2 days after Romney made jobs the center piece of the debate ... where he creamed Obama ... abra kadabra, Obama instantly increases jobs by a whopping 3/10 of a percent ... does anybody really believe this Obama B.S. ??? I believe you missed Howard's point. The jobs report was hit by a sudden destructive influx of falsehood. I apologize Thomas, I see now you were replying to mcskadittle. I agree with your previously stated question completely. I have no doubt that Liberals will try and spin this as proof that Obama's economic system is working. Well they are just showing their willingness to lie, or that they do not understand the problem. The truth is 150,000 jobs are needed each month just to keep up with population growth. The reason for the lower percentage is because so many people dropped out of the job search. Two years ago Obama claimed that the economy is headed in the right direction and Biden predicted the creation of 500,000 new jobs a month. Remember Geithner's New York Times "Welcome to the Recovery."? Obama and his guys are ignoring the unemployed, in Obama's world they do not exist. How good American, I am hapy to see our country recovering slowly!!. It make me very sad to see all my republicans cooworkers pist off because the unemployment rate drop. How indpendent voter, I am wondering if I ever will vote republican again. Republican don't care about this country. 2. "Obama and his guys are ignoring the unemployed, in Obama's world they do not exist." You have to be joking or really ignorant. liberals are about "freedom" The root word liberal is liberty which means free. Liberalism is the strive for equality. How can you say that they don't care when they are all about representation in the government. They look out for the little guy (the poor) while conservatives want to keep reaping in the money. Did you know corporate theft is higher than street crime? go look it up. What do the conservatives love? big business. I suggest you do more research before you spout off any more lies like Romney. They call extreme liberals SHEEPEOPLE behind closed doors in DC? That's Sheep -People. People led like sheep. Their own party is actually making fun of them and they don't know it. Everyone should do themselves a favor and try to remember never to be led by emotion. A sign of intelligence. Back to school buying and the Labor Day holiday are over. Business hires for any holiday or necessary buying like back to school then lays off until the next customer crush. That is the reason for the adjusted numbers and it will happen again for Halloween, Thanksgiving and big time for Christmas and New Years. Romney is the man who said he did not care about the 47% – Obama does because he knows it is steady, permanent jobs that are needed, not the part time or temporary jobs so popular with Romney and congressional Repulicans. It might be a savings for business to buy and hire for holidays and events but it will not cure this fiscal mess created by Wall Street espousing outsourcing and sitting on all of our tax money they are getting. No amount of trolling Republican talking points or criticizing the President will get voters to forget the taxation or hardships forced on us by Wall Street corporations and their obscene profits wrung out of us. Thank God November is coming. Do not worry, Americans are dumb as Romney. 7.8% is just what Romney need, to slap on his own face. He Lied in the debate, even the blind ones can see it. He denied the 5T tax cut for the wealthy which he has been preaching for 18 months. Are we all dead so he can fool? OBAMA LIED ... AND OUR AMBASSADOR DIED. OBAMA LIES ALL THE TIME, AND THE OBAMA STOOGES ARE SO STUPID, THEY BLINDLY BELIEVE ANYTHING, AND EVERYTHING HE SAYS. OBAMA WILL SAY, OR DO ANYTHING TO HOLD ONTO POWER ... SO WILL ALL THE OBAMA APPOINTEES ... IN ORDER TO HOLD ONTO THEIR JOBS ... SO WILL ALL THE FREE LOADERS, WHO WANT TO HOLD ONTO THEIR OBAMA FREEBEES AND HAND OUTS ... AND, TO CONTINUE HAVING THE HALF OF AMERICA WHO PAYS TAXES, PAY THEIR BILLS AND CARRY THEIR WEIGHT. THIS IS THE SO CALLED 'FAIRNESS' OBAMA CONSTANTLY CROWS ABOUT ... IT'S ALL B.S. !!! I certainly hope American's are smarter then that last post you wrote can across. Rather: I certainly hope Americans are smarter then that last post you wrote came across. Check your facts on education least you look uneducated. Don't forget Romney is a Governor.He has a track record. His state is #1 in education. Think about how small businesses survive, why they hire larger staffs, and who spends the money. Heavy taxing reduces the money spent on small business. This causes a reduction in revenue, layoffs and business failure. This is what is happening right now. Business is not generating enough money to hire additional staff and in many cases even survive. over taxing the wealthy, who do you think tips the wait staff, pays $200 a month on their hair, buys 3 gym memberships a month. Among the myriad of reasons that I am voting for Obama is that he is over the top more honest than Romney who flip flops on every position if he thinks thats what a particular audience wants. Romney lied his way thru the debates and changed his position drastically. There is no way anyone can anticipate what his positions and policies would be in the White House – whoever he listened to last? DOES ANYBODY ACTUALLY BELIEVE OBAMA, OR CNN ANYMORE ??? No! Thus the poor ratings, and even poorer ratings for MSNBC. No one truly intelligent believes Obama. It takes very little research to determine this. Moral character comes to question. Obama attends a New York fundraiser hosted by Jay-Z and Beyonce while Al-Qaeda flew their flag over our embassy. Then vote for Romney and don't watch CNN or read their articles. That simple. As Josef Stalin once said, "it's not the votes that count, it who counts the votes" that really matters. Just forget for a moment that two of the leading economists for the Bureau of Labor Statistics happen to be big Obama contributors. Weekly applications increased last week by 4,000 from the previous week's level of 363,000, the Labor Department said Thursday. The previous week was revised higher from an initial reading of 359,000. The four-week average, a less volatile measure, was unchanged at 375,000. and unemp went down B.S. !!!!! He will do better! BTW: look at the chart for this article. This is weird, the number of jobs added was less than last month and the number of 1st time filers are up by 4000. How does that translate into a bigger drop in the unemployment rate? The real rate, U-6, is still the same because people are getting parttime jobs or stop looking. IT'S JUST MORE OBAMA / AXELROD SPIN AND B.S.. OBAMA, AND HIS CORRUPT APPOINTEES, WILL SAY, OR DO ANYTHING TO HOLD ONTO POWER ... AND, THE BIASED MAIN STREAM MEDIA WILL PROMOTE THEM, AND COVER THEIR TRACKS EVERY STEP OF THE WAY !!! You are absolutely correct. Let us not forget that often these numbers are revised 2 weeks hence, into even worse figures. Really, check your facts. What Romney said was 47% won't vote for him. "Won't " is too strong of a word. More factually correct would have been for him to state that 53% of America's don't want government handouts of any type. They prefer to keep their tax dollars and therefore are more likely to vote for him then the remaining 47%. Obama on the other hand says give me UP to 70% of all you've earned, and I will decide where it goes. If you reap part of that 70% then you probably will vote for Obama. Free Money off someone else's back. What's it to you. you aren't paying for it. Another piece of positive news for Americans and President Obama! Obama's policies are working! My God, take a look around. Do you know what they call people that hold your beliefs in DC? Sheepeople. That's Sheep -People. People led like sheep. Your own party is actually making fun of you and you don't know it. Do yourself a favor and try to remember they both lie. Start with a time line, 1939-2012, the USA as a world power. Unemployment rate magically drops below 8%. Politically engineered. It took four years, but a positive jobs growth number and lower unemployment rather is fantastic! The recovery took less time than the depression! 1.4 million Americans filed for 1st time unemployment last month and the unemployment rate still went down? Only absolute idiot can believe this number. I never saw in my life so corrupt government. The Labor Department – a so-called "non-partian" entity, much like the DOJ and news media, . In May CNN ran a story of this subject. NEW YORK (CNNMoney) - There are far more jobless people in the United States than you might think. When and where ...can you honestly produce one of these people who are actively not looking for a job? I'm sure there are people who are discouraged in looking for a job, in their local area, and in their field of experience, but actively not looking..I doubt it. Jean, the Department of Labor actually tracks these people. Discouraged workers are persons not currently looking for work because they believe no jobs are available for them. I can produce 23 on my block alone. By the way, most that have stopped looking for work are solid middle class too experienced to work for McDonalds. Additionally, McDonald's cannot meet the mortgage on their $283,000 home, now worth $129,000. To answer your question. YOU BETTER BELIEVE IT ! Wait for November, The number going to be even better. I cannot understand what is going in our country. .3%age points is not a "tumble"- Any bets on how many people gave up looking our futility? Or whether CNN will report on it? This unemployment rate is false clearly. It will obviously be revised but ONLY after the election. It's a shame when they politicize the jobs numbers. Let us all hope the numbers are real and we are heading in the right direction. How many of us really thinks these are real numbers? Especially given the fact that they are going back two months and adjusting up. Something isn't right here. Many are questioning these number because nobody predicted the unemployment rate would fall. It's a little suspicious, but with Obama's Chicago style presidency, everything is. If you don't believe Obama is telling the truth on Fast and Furious or the Libya terrorist attack... don't believe this either. President Obama is fixing in 4 years what it took the Republicans to ruin in 8 – Lets Keep Moving Forward! Actually the employment numbers are real numbers, and next month the numbers for this month will again be revised upward. I think I mentioned on this site or one of the other CNN sites yesterday that for the first time Wednesday I drove by a construction site of new homes being built...3 months ago when I traveled that way the site was a field.This is a good sign as construction comes back so do other jobs. But then again...Mitt has proven that he will say anything, hasn't any qualms about lying (or flip-flopping) and wouldn't know the truth if it kicked him. According to his current disavowing his 47% comment...you can take that one or two ways. Either he was lying to those rich contributors in that closed door room, or he is lying to the American people now. So rich little boy when caught in a difficult situation comes up with the..." I swear I didn't do that." I vote he is lying to the American people now. Just one question Jean. Do you feel that everything President Obama says is true? I feel President Obama has a better record than Romney, who will say one thing one day and something else when what he has said earlier trips him up. Fact is; Romney can try all he wants to undo his 47% remark, but there is no way he can undo that 47% remark for the people who we all know have bought and paid for him. .
Jean, Guantanamo Bay is still open for biz. Obama promised to return America to the "moral high ground." -If the economy does not inprove, I'll be a one-termer. Say one thing and do something else? Yeah, that pretty much sums it up! Obama has better record as senator than Romney! How could that be? Obama has better record as president than Romney. Again, how can that be? Romney has a better record as a governor than Obama. Why? It all depends on what you are comparing Obama's record to! "The responsibility lies not so much with the White House but with Congress, which has thwarted President Barack Obama’s plans to close the detention center, which the Bush administration opened on Jan. 11, 2002, with 20 captives. Congress has used its spending oversight authority both to forbid the White House from financing trials of Guantánamo captives on U.S. soil and to block the acquisition of a state prison in Illinois to hold captives currently held in Cuba who would not be put on trial — a sort of Guantánamo North"
jean2009, Yep same answer, blame someone else. I will give you credit Jean. That was a good answer to my question. I think the short version is no, you do not believe everything the President says. However, you believe him more than you would believe Romney. You are right, the 47 percent comment is not going away. The Presidential campaign and media will not let it. I can just see Chris Matthews now drooling over it. However, the President has made some bad statements we will never hear unless from the Romney campaign. Remember Bill Clinton, his new buddy, accused Candidate Obama of using the race card. I wonder where that tape is? And, if I recall, there is some questions as to why certain energy companies received stimulus, gave executive large salary increases and donated to the Obama campaign. Still, it was a good answer. – No country including the US wants to house the prisoners and they can't be tossed in the sea, so gitmo remains. Caramon...I believe there is a difference between what a candidate states is their goal (not a promise) and what can actually be delivered with a two party system (not a dictatorship). How many dogs do we need to have chained on the roof of a car, or a person with a military deferment who protests FOR others to fight and die instead of just thanking his lucky stars and keeping quiet, or a bully who cuts another student's hair, the man who has stated "he likes being able to fire people"...and the lie after lie and flip flop after flip flop on every issue once it is found he was obviously originally on the wrong side....look at his disavowing Romneycare....anything to cover his behind. Really, this is not presidential material, this is a grown spoiled rich boy with no moral compass that wants a toy of power. You are entitled to your opinion..but that is my honest assessment of Mitt Romney. In all my years I have never had a candidate that scared me more. I am pesonaaly happy GITMO i sstil open. BUT it was STILL a PROMISE none the less! Every now and then I post a response. CNN still drops it to the bottom. Jean look down below. Obama has cooked the numbers. The reasons for the differences in the two numbers in the labor report. The 114,000 jobs created number is gleaned from reports received from businesses....who we know is deflating the number of jobs being created. This explains why those numbers are revised upward each month over the last several months. The second figure 418,000 people entered the work force comes from a survey of households. The best part of the good news is the fact that 189,000 are no longer long-term unemployed and 468,000 fewer people became unemployed. Maybe read About.com-Unemployment drops to lowest level in 3 1/2 years. STEVEO -The fact is the economy is improving., and the deficit is increasing at the slowest rate since Eisenhower was in office. From Politifact: Says Mitt Romney is wrong to claim that spending under Obama has "accelerated at a pace without precedent in recent history," because it's actually risen "slower than at any time in nearly 60 years." So, using inflation-adjusted dollars, Obama had the second-lowest increase - in fact, he actually presided over a decrease once inflation is taken into account. So man you are posting much, listening too much to FOX and not reading often enough. I don't believe the PROMISE was to slow down the the rate of defict increase. The promise was to HALVE the deficit, Remember? It appears your crystal ball need some maintenance! So, using inflation-adjusted dollars, Obama had the second-lowest increase – in fact, he actually presided over a decrease once inflation is taken into account. Sorry Jean, this one I am not buying. Inflation is currently only 1.7 percent. In 1980 is was over 13 percent. Yet, so many people accuse Reagan of doubling the deficit over 8 years. If spending continues then the deficit will double over the Presidents 8 year term. It simply doesn't add up. So, then you may want to check the figures out with the figures at PolitiFact which I just referenced and their numbers charts. President Obama has a -0.1 percentage debt inflation rate increase compared to Eisenhower's -0.5 percentage rate. Yes and no concerning Politifact. This is an old trick used by politicians. Stats could be a strange thing. Two people could look at a set of numbers and draw two completely different answers. It is something politicians do best. When adjusted for inflation it shows that the President is not a big spender, true. Without the inflationary adjustment he is. According to Forbes and other sights, overall spending has increased dramatically. Another figure that should enter the equation is GDP. I believe annual spending in terms of GDP has gone from around 4 percent to 10 percent. Of course most of this is irrelevant considering the overall deficit. At what point does the deficit become a concern, 17T 20T or 25T. Eventually the deficit will be a problem. Why wait until then? Meanwhile.., another $3 Bilion was added to your childrens debt today.., and each day here after, that Obama and his progressively liberal big spenders remain in control of Congress. Well Jean, I believe the comment that Mitt Romney stated was that he was not concerned with gaining the vote of the 47 percent. It was a little out of context. Although, I understand your concern that it also had to do with 47 percent of the voting population on some form of government assistance. Many on assistance include people in the senior years and disabled. In this regard I fully understand. However, what surprises me most is the moral compass. I am certain you supported Bill Clinton. How do you feel his cheating at least 3 times on his family meets any moral compass? I feel this is a serious flaw in personal character and not presidential material. I will tell you this. It is something I never could do to my family. Caramon, Jean loves Clinton. She does not have a problem with his lies and cheating. She also loves Obama and will forgive him for anything. Liberals are blinded by their hate. By the way Jean, hows that Republican controlled Ohio government working out for you? You are always bragging about new home constructions, unemployment. Just imagine if Republican controlled Federal Gov. Jobs, Jobs, Jobs! Ohio jobs were not created by Kasucks...but by the auto bail out, the stimulus, and the good policies put in plce by Governor Strickland. Do not worry, Americans are NOT as dumb as Romney. 7.8% is just what Romney need, to slap on his own face. 2020 I will ask you the same question I asked Jean. Do you believe that everything the President says is true? Let's see if your answer is as honest as hers. I was working 2 years ago in Lousiana. The state was extending the q pe long bridge in the missipi river. It was full of latinos. Now I am working here North carolina. Infront my aparment the ar constructing three big condominums building. it is full of illigal workers doing very good money. In the corner of that street I see every day some folks asking for money for drugs or alcohol. My son friend parents are illigal and they have about 3 part time jobs. They have about 1000 in income weekly. they walk to their jobs. because they don't have car to drive, no driving license. In conclusion; The report of the labor deparment should be O. How is posible that people With SS and Driving license don't have job?????? With the new September jobs total plus the revision for July and August brings the third quarter jobs total to a average of 146,000 new jobs per month. This is good news for the economy and Romney acknowledged this but added this is not a real recovery without specifying as usual what constitutes a real recovery. How many jobs per month in a real recovery? Maybe we got some insight on want Romney thinks on this matter from David Brooks, who took the same line regarding real growth but added specifics, he said, "a real recovery would be adding 300,000/400,000 per month". Apparently nobody bothers to do some simple math. The best job creation performance was by President Clinton roughly 22 mil. in eight years (96 months) that averages out to 230,000 per month. Homework! Romney continued in his critique, saying their are millions not reported because they stopped looking for work. I am not sure were they get these kind of numbers. My son ran out of his unemployment but didn't move under a freeway underpass. He's now working, so do they know he's working and have removed him from the stop looking for work group? How does anybody track this. You take things that suit your message. Make them believe. "The US added 114,000 jobs in September, a pretty lacklustre figure and roughly in line with the number of jobs the US economy needs to add just to stand still. But the jobs figures for July and August were dramatically revised upwards. Employment for July was revised from 141,000 to 181,000, and the change for August was revised from 96,000 to 142,000. Together they managed to move the unemployment rate below 8%." It is incredible that the July and August figures were revised upward by 48% (from 96,000 to 142,000) and by 28% (from 141,000 to 181,000). Such dramatic revisions two months in a row, is unprecedented. And these revised figures, more so than the much smaller 114,000 for August, are the reasons for the sharp drop in unemployment rate to 7.8%. It is naive to assume the bureaucrats who prepare the job reports will distort the figures only when directed by White House or any outside parties. These bureaucrats can be biased and can distort the figures by themselves without outside direction. And they, being government employees, would inherently prefer a president who fundamentally believes in big government and growing jobs within government. As all statisticians and economists would agree, given the volatile nature of these job reports, it is much more meaningful to look at the trends distilled from several reports than a single one. Even the revised figures show job growth is on a steep downward trend, dropping 37% from 181,000 in July to 114,000 in September. Only a shameless president who has failed to restore the economy over four years will cling to a single monthly report and proclaims it as his achievement. I study the job market across the nation religiously and have seen a steady decline. It has slowed down but has not come back. No one believes these lies and the media is simply a tool for the rich and powerful rulers of the world. We are not buying it. No one believes you anymore you liars. MSNBC who worships Obama and other liberal outlets slam the accusations and then don't allow viewers to comments! This is absolutely ridiculous and some will be fooled and think well positive thinking is good but the reality of it is that things have to be working not just positive thinkers. I don't know how else to say it other than from my own observation I can say without any shadow of a doubt that those jobs numbers are a lie and the real unemployment rate is around 20% and in some cases up as high as 26%. Homeland security has ordered 1.5 Billion rounds of hollow point bullets and is getting ready because the truth is this economy is going to collapse. I ain't voting for either of those puppets! I am writing in Ron Paul and if anyone ever wants a change a real change that is what you will do too. That is what the smart people will do who know what is really going on. When you vote write in Ron Paul. What am I doing wrong ? I wrote this last night. we now know that by a large majority Americans don't believe these job numbers...kinda like when the obama birth cert thing was in full swing...Bin Laden passed away...hahaha now a favorable jobs report after BO gets his hind end kicked in a debate, another lame game from the manipulator-in-chief. Those who can do DO those who can't blame and manipulate...time for adult leadership. It would be naive to assume the bureaucrats who prepare the job reports will distort the figures only when directed by White House or any outside parties. These bureaucrats can be biased and can distort the figures by themselves without outside direction. And they, being government employees, would inherently prefer a president who fundamentally believes in big government and growing jobs within government.
. . . .Just for the Chance to Live in That White House!"